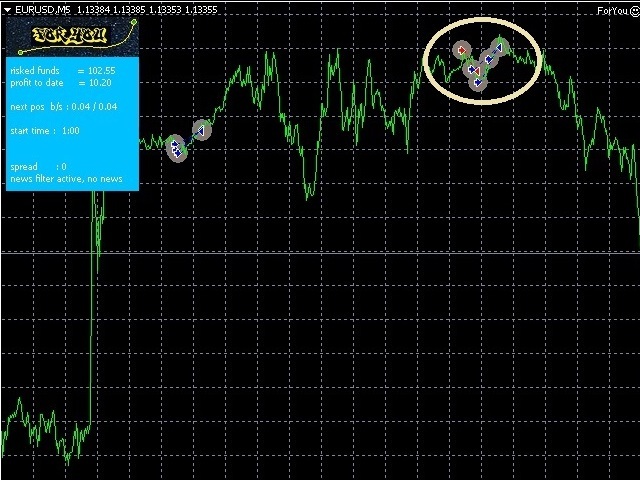 Expert Advisor For You trades pairs EURUSD, GPBUSD, in PreAsian and Asian session. Almost offside from geopolitical news silent trading is possible during a narrow time window of 4 hours. Fully automated, no manual intervention needed or advised. Allow http://ec.forexprostools.com/ in options tab to allow use of News filter : Open Tools > Options > Expert Advisors. Check the option "Allow WebRequests for listed URL:". Enter http://ec.forexprostools.com and press OK. Restart MT4 terminal afterwards. - new parameter 'verbose' to print extended log messages. Default is false. Modifying and high spread messages will not fill up log anymore (less VPS ressources as memory/CPU/file system). Switch on in case of problems as a debug option. - bug fix : no longer adapting SL/TP on EA inactive status (=button red button 'EA off'). -will adapt vTP and BEpoints (break even points) to market condition. -new parameter will have the possibility not to start Friday evening. Swap over weekend might decrease profit. Backtest does not show losses due to gaps or news over the weekend. friday_logics=true, dayofweek friday=5, friday_stop_time=12. If your GMT offset is very different from GMT+2 you may need to change day or time. For most brokers Friday 12 (noon) is a good time to decide we are on the day where market stops and expert advisor will not open new baskets. -new button "Time On"/"Tome OFF" allows to toggle between time window (start-/stop_time) and timeless 24h trading. -added informational profile name in parameters, profile will be shown in line 1 of panel. Compare cross and time frame with name of profile ti run safe. This will avoid running wrong profiles on charts ( sometimes default values are active after expert upgrade). -added Wednesday logic to prevent triple swap. Only trades with negative SWAP will be prevented on Wedenesday evening. -added parameter close_avg_SL=0. If >0 expert advisor will close basket in loss if average negative pips reach close_avg_SL value. example : with current 4 positions and close_avg_SL=60, expert advisor will close with -240 pips. -added broker parameters (consider_comm=false, max_brokers_profit_percent=20, comm_per_lot_in_backtest=5.5) to maximize profit. If set to true, profit will give maximum max_brokers_profit_percent to the broker. Profit 1€. Commission 0,1€ -> Broker got 10%. With a TP of only 5ips be careful not to decrease value. Otherwise positions might be preventd to close. Real commission doesn't work in backtest. You can set a commission value with comm_per_lot_in_backtest for 1Lot round turn as your broker indicates for your base currency and pair to see values in backtests log. This parameter is not needed in real or demo trading. -new button "Time Off" to ignore start trading window. If pressing "Time Off" , expert advisor will start trading as soon as entry condition is given. To use carefully in day trading. You can go back to regular trading time with repressing "Time On". -show and react on DD caused by ForYou for option close_percent. Up to v1.6 DD was shown as total DD on account, internal DD was not visible. This parameter allows to open faster opening of consecutive positions once the first position was triggered. Default value is true. and specify break even pips (per position, BE_order_pips) . Using this mechansim permanently will reduce profitability by factor 2. Use selectively in critical situations or leave switched off. -minor bug fixes for first bar after start / opening market. Added parameter open_max_percent to prevent start trading when other charts/positions are open and exceed defined value. Default 5 (% draw dawn). This will protect account from too much load.